You've been working on your WordPress website for months now, the last thing you want is for something to go wrong with your security the moment you set it to go live. 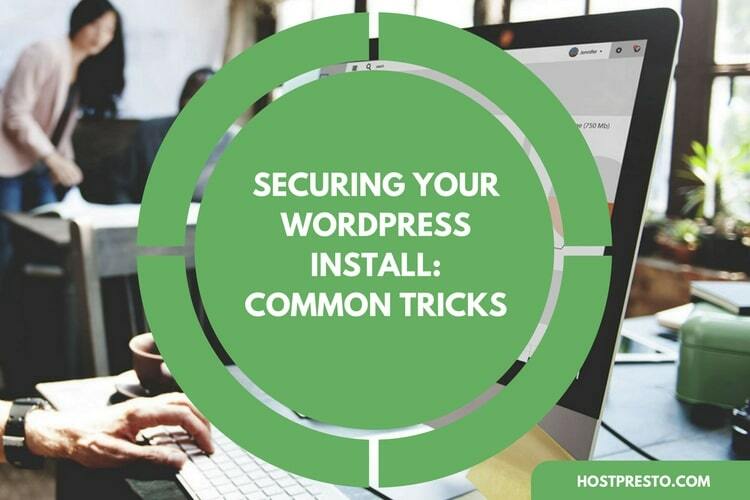 While security might not be the most exciting element to think about when you're producing a top-of-the-line WordPress website, it is one of the most important things you'll need to consider before you can become an internet sensation. Everything from the plugins you choose to install to the themes that you end up using can impact the experience that your customers get and the overall safety of your online presence. While security is something you'll need to address on an on-going basis as your site continues to grow and evolve, we've put together a few tricks you can keep in mind to help get you started. One of the best ways to secure your WordPress install is to use two-factor authentication. This is a combined way of providing login credentials to a service, often in the form of something you have, and something you know. Many providers like Apple, Google, and Dropbox offer this secure way to log in, so why not try the same thing on your WordPress website? All you need to do to implement this strategy is use one of the many incredible plugins available today. There are countless options to choose from, so make sure that you check the reviews when choosing the one that's right for you. For many users, plugins represent one of the most powerful and innovative elements in the WordPress ecosystem. There are tens of thousands of plugins available in the WordPress repository, all designed to help you accomplish different things. However, it's important to make sure that you only download and install the most secure plugins if you want to keep your website safe. Whether there are any comments or opinions available regarding the plugin. Before you install a plugin, you should also consider doing a full backup of your website and information. Whenever a security issue occurs in WordPress, you can rest assured that a patch is already being worked on that will help to fix it. However, this means that you need to keep your website updated if you want to avoid any security problems. Having all of your files updated along with plugins to the latest version available can easily improve the security of your site. The good news is that you can set your WordPress site to simply update automatically, so you won't have to worry as much about going to your dashboard and implementing updates yourself. Trackbacks and "pingbacks" are the notifications that let you know when your content was linked to by another web page. Most users don't care about them very much, but they can be useful when it comes to measuring SEO efforts. Unfortunately, by using your trackbacks, hackers can sometimes cause massive DDoS attacks which leave your system in shambles. If your WordPress site is new, and you want to reduce your chances of problems in the long term, it might be a good idea to disable trackbacks by going into your Settings, then clicking on the "Discussion" tab. Here, you can uncheck the "Allow link notifications from other blogs" option. The heart of your WordPress website is your WP-Admin directory, and this is the part of the site that you need to protect most if you want to keep your online presence running smoothly. One of the best ways to avoid breaches is to password-protect your WP-Admin directory. This security measure means that the website owner can access the dashboard through two passwords - one protecting the login page, and one protecting the admin area. You can also go to the Plugin directory and use the AskApache plugin to secure your admin area. This automatically generates a file that encrypts your password and makes sure you have the right file permissions in place. Using an SSL on your WordPress website is one of the smartest ways to secure your admin panel. The SSL ensures that all of the data transfer that happens between the server and users is completely secure so that hackers can't simply breach the connection. The good news is that getting an SSL certificate for your site couldn't be easier. You can purchase this option from a dedicated company, or simply ask your hosting firm to give you one. There's plenty of different options available, and many great hosting companies will simply offer SSL encryption as part of their hosting package. Remember, Google ranks sites with an SSL higher than those without one. That means that not only are you more secure, but you can get more traffic too. Finally, the default settings on WordPress mean that your login page can be accessed through WP-admin or WP-Login.php which is added to the main URL of the site. Unfortunately, when hackers know the direct URL of your login page, they can try to force their way in using brute force. A Guess Work database can be used to gain access to your system, which can quickly lead to serious security problems. Each of these actions quickly secures the different routes into your site.